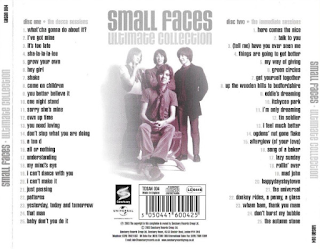 This excellent, virtually definitive collection covers this iconic British r'n'b group - Steve Marriott (vocals/guitar), Ronnie Lane (vocals/bass), Kenney Jones (drums) and Ian MacLagan (keyboards) (Jimmy Winston initially was in his place). 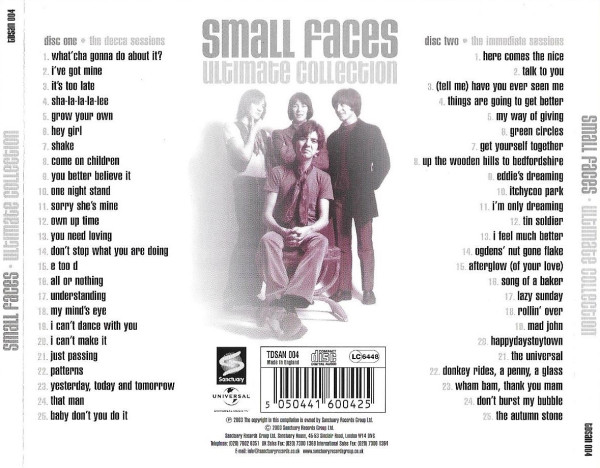 The two CDs are ideally split into covering, firstly, their frantic, soulful r'n'b sound on the Deram label which saw the group emerge as favourites of the mod culture; and, secondly, their drugged-up psychedelic, post 1967 phase. Like many groups of the time, around 1967, they underwent a major change. Lots of blues/r 'n' b/pop groups, inspired initially by The Beatles and also by the whole hippy, druggy culture, "went weird", and the music they produced was far more experimental as the whole psychedelic thing took over. Despite this, they still had several big hits during this period, so they didn't go completely out of it, man. They always retained a wry, tongue-in-cheek humour and never deserted their London working-class roots. I always got the impression that psychedelia never sat too comfortably with the folky side of Ronnie Lane or the rock side of Kenney Jones, though. Slightly opposite to that, though, was the fact that some of their 1965-1966 chart material was way more "serious" and deep than that of their contemporaries and surprisngly uncommercial. I have always been amazed that the intense, blues-influenced guitar rock of "All Or Nothing" got to number one. It was not remotely poppy. The same applies to the beguiling, trippy rock of "My Mind's Eye". By the way, you can tell exactly when the change took over and psychedelia came in. It starts with "Yesterday, Today And Tomorrow". Other highlights are the early hits - the delicious, thumping soul of "Watcha Gonna Do About It", "I've Got Mine" and the irresistible "Sha-La-La-La-Lee"; the Isley Brothers' cover "Baby Don't You Do It"; the dreamy rock of "Here Come The Nice" and "Itchycoo Park"; the power of "My Way Of Giving"; the "Revolver"-era Beatles-esque "Get Yourself Together"; the sensitive "Afterglow Of Your Love" and the noisy, bluesy r'n'b attack of "Tin Soldier". The infectious instrumental "Grow Your Own" has a riff that surely Paul Weller adapted for "Peacock Suit". The just can't help but enjoy the upbeat early numbers like "Hey Girl" and "Shake", either. Praise also has to be given for the excellent sound quality on this. Small Faces material has not always had great sound but here it is finally given a good re-mastering. Nice and bassy. Apologies to all, but I have always hated "Lazy Sunday", though! "HappyDaysToyTown" is even worse. 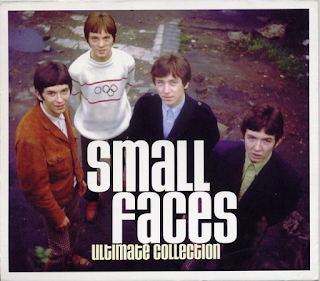 Marriott went off to form Humble Pie, while Lane, Jones and MacLagan were joined by Rod Stewart and Ronnie Wood to form another iconic band - The Faces.